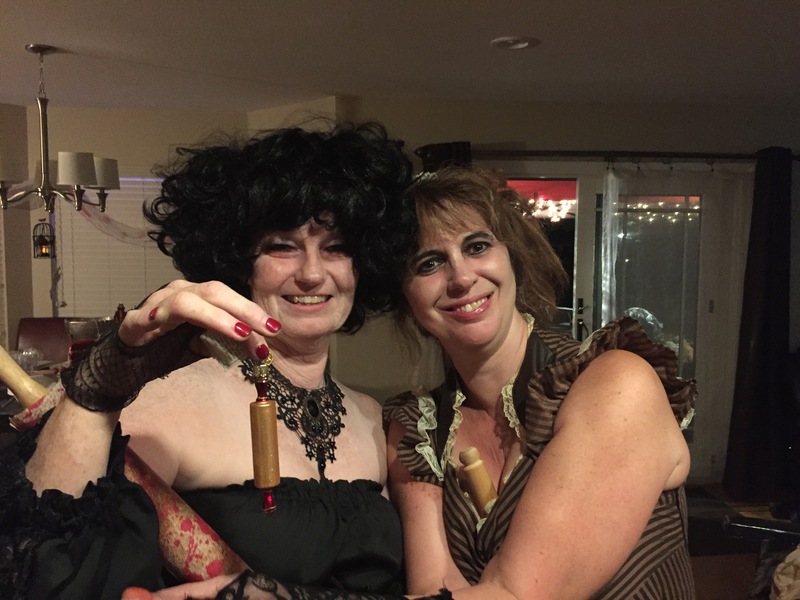 This entry was posted in Halloween and tagged carving pumpkins, celebration, growing pumpkins, halloween parties, meat pie costume, Mrs. Lovett costume, Sweeney Todd costumes. Bookmark the permalink. 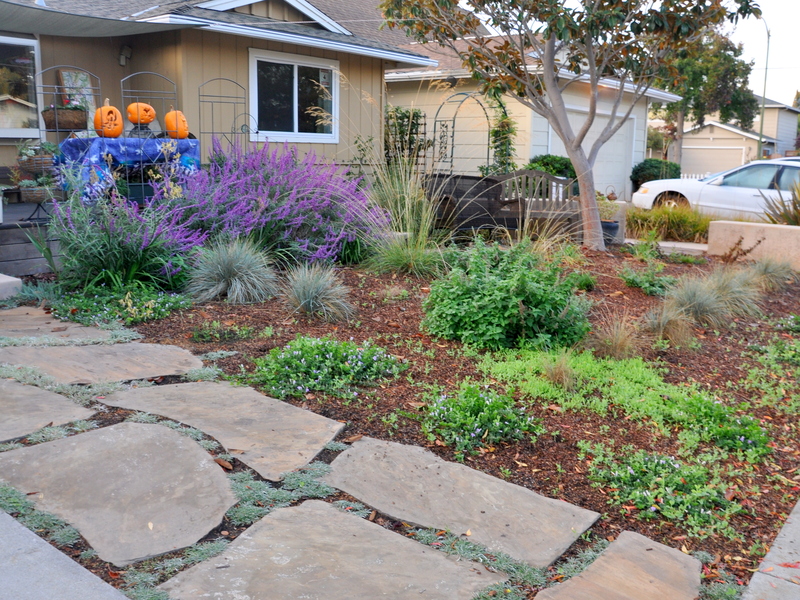 I love looking at how others are handling the need for drought-tolerant landscapes. We live in Southern California and have been making enormous changes, also. We still have some lawn, but because we’ve been treating it with an organic product designed to “hold” water, we aren’t using nearly the water we once required. We’ve expanded the garden beds, took out the roses and some well-loved tropicals, and have incorporated natives and a huge number of succulents. I am in awe of how many of our neighbors are doing the same. I spend about a day a week at the Huntington Botanical Gardens and even they have begun to highlight the most gorgeous drought-tolerant garden designs. Yours is beautiful. I really enjoyed visiting! You’ve clearly had a blast this Halloween season, and I hope you can keep it up as Thanksgiving and then Christmas and New Year approach! I’d love to turn our 3/4 acre of grass over to planting, but there’s just too much of it. I’m hoping to get some trees planted during the Wet, and create a series of islands in the sea of grass; a tree on each, surrounded by shrubs and lower plantings. But it’s going to depend on my back, and whether I can persuade the ride-on mower-loving Husband to sully his straight line mowing and glowing green lawn… We’ve just had the first big thunderstorm of the Wet season, and the grass that was crispy two days ago is growing almost visibly. I love the lace around your neck. It’s stunning. I’m sure the garden will fill in even more by next year as it’s looking quite at home already. 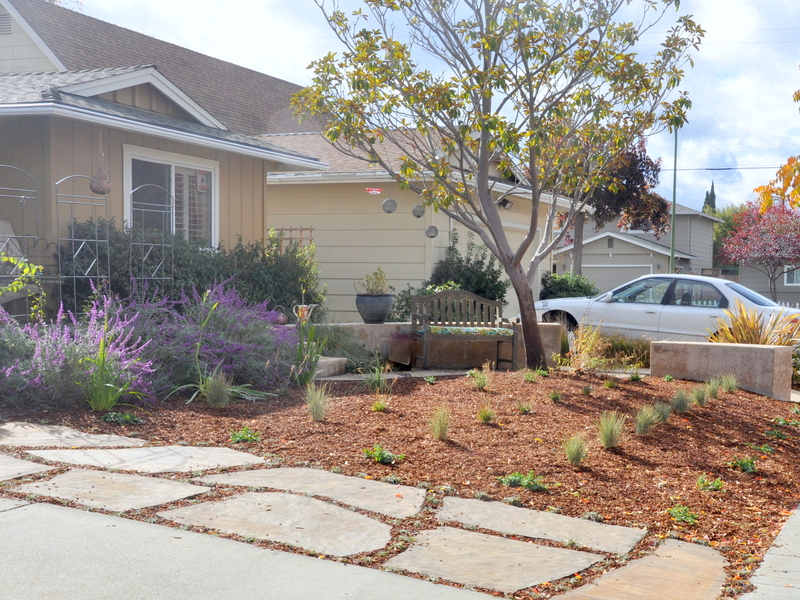 Good call with the xeriscaping. Hopefully you will get some rain to catch. 400 trick or treaters is almost scary in itself. I had maybe a dozen. You guys really know how to do it up right. The pumpkin carving was terrific. How he keeps coming up with new ideas is impressive. That is some wig and costume. It had to be so much fun to dress up like that. Marlene, you are a clever clogs! I had to look up ‘xeriscaping’ as it is a term have not heard before – hardly surprising as our gardens are more in danger of drowning from the ceaseless rains we are currently having and summer may well continue the big wet……… I think it is going to be exciting watching Alys’ garden grow and fill out in the coming years too. I worked for a landscape architect for 6 years. Learned quite a bit as well as living in Southern California for 25 year. Even back in the 1980’s we were xeriscaping. It looks like we are all going wetter and warmer. You were all ahead of your time, Marlene. Your garden has grown so much in one year – imagine what year two will bring! 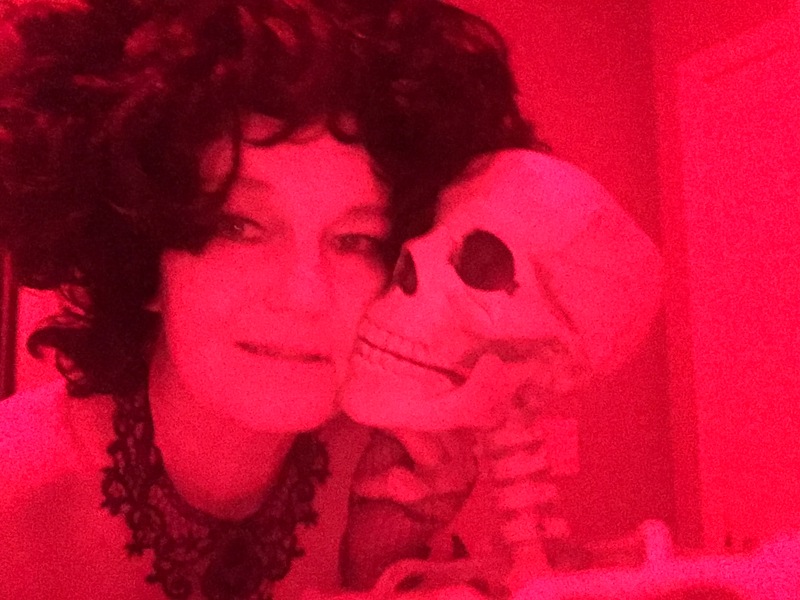 Your costume is a delight – I love that wig – and Mike’s is a hoot! Such a shame that time is ruining your ability to party all night for three nights running, that’s a big ‘Boo!’ to Father Time!! And of course, I can’t depart without leaving a big round of applause for the master carver – they are phenomenal. I can’t believe he does this in one day – the man must have the dexterity and motor skills of a …… well, a master carver!! I’m glad you have had such a good month – next stop Thanksgiving? Pauline, it’s been fun to watch things grow and to see the space filling in. I’ve been told in the past that it takes about 18 months for perennials to really take root. By next spring, things will be looking quite at home. 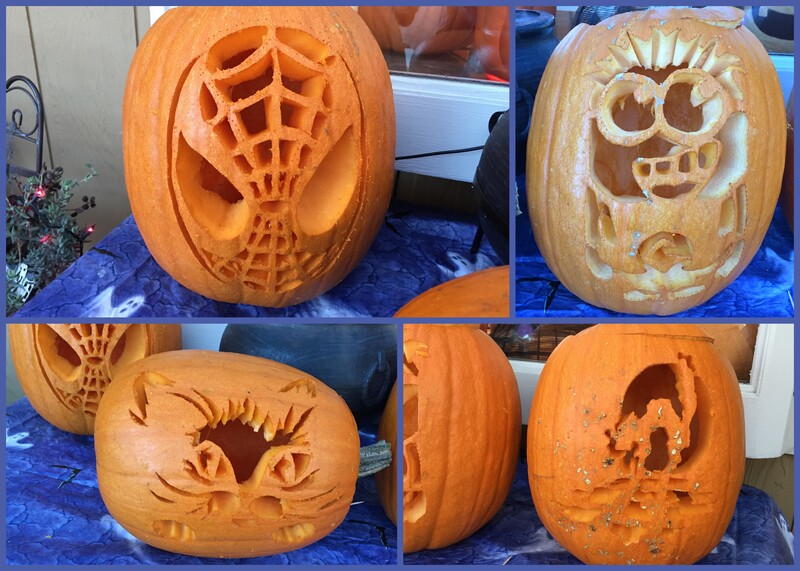 Mike does an amazing job carving those pumpkins. He really enjoys it, too. I would never have that kind of patience. I will pass on your well wishes, or better yet, I’ll encourage him to read them himself (as I often do). Amazingly, the carved pumpkins lasted a full week! They just started to mold today. I fished out the candles and carted them to the compost bin. I’ve left a nice pile of seeds in the center of the garden as well (hint, hint little squirrels). Your garden is looking great! Just wait for the next year. I bet you’ll have a hard time finding the ground! I like the idea of a well-camouflaged lawn. Thanks for making me smile. I love the garden! It looks fabulous, and what a bonus that it attracts all those beneficial insects. As for Halloween, my, my, you two do not do things by halves! The pumpkins are marvellous and what awesome costumes. Mike’s just takes the cake, or at least the pie. He is a good sport! Looks like fall was a great season for you. I will be thinking of you over the next few days, during the election and it’s aftermath. Hello Wilma! Thanks for your well wishes and good cheer. I’ve really enjoyed the garden transformation this year, and look forward to seeing the brown ground disappear even further as the perennials and grasses grow. Mike is a good sport…and he really enjoys it. It’s fun to laugh. I’m so stressed about the outcome of the election but I keep reminding myself to breathe. Breathe and vote that is. Thank you for your good thoughts. 48 hour from now the polls will close. I’m hoping history is finally on our side. I think the whole world is stressed about your election. Our thoughts are with you xoxo. Thank you! I don’t miss that lawn one bit. Having it gone is downright liberating. You crack me up, with your enthusiasm for Halloween and those costumes! What fun! Now you’ll need to catch up on your sleep, to get ready for Thanksgiving and Christmas. I loved seeing the photos of your garden and the ways it’s developing and filling in. It always amazes me to watch this kind of transformation and yours makes so much sense, in terms of fitting into the realities of your locale. Kerry, I’ve come full circle. I now completely embrace my “inner theatre geek”. I love the challenge of creating a costume around a theme, and I always like to do something a little different, hence the meat pie costume for Mike. He’s such a good sport. Our Thanksgiving is low key most years. Mike loves to cook and I like to decorate, so we’re a good team. I’m originally from Canada, so our Thanksgiving was in October. We have another family over to celebrate with us (also originally from Canada), and we have a non-traditional, international, vegetarian meal. Do you entertain in your home for the holidays? We used to throw a humongous Christmas party every year. Did it for years and then just stopped! It was fun but so much work. Now we are peculiarly low-key about holidays. Our family members are scattered far and wide so we don’t always get together and we don’t go in for spending pots of money on gifts. I do like Thanksgiving a lot and wish ours was in October instead of so close to Christmas–I think it gets a little overlooked. Kerry, we used to throw a big Halloween party for the neighborhood children, and like your Christmas party, it just stopped one day (as they aged out) and that was that. I missed it the first year, but quickly realized that I would have more time and energy to do other things. It all worked out. I hope you have a wonderful Thanksgiving. And I applaud you for your financial restraint around gifts. I work as a professional organizer, so I’m well versed in the piles of “guilt gifts” that people can’t seem to part with, but that they don’t want or like either. I try to give consumables as gifts (food, dishtowels, books, candles and even donations in someone’s name). I don’t always succeed, but it’s a good goal to have in mind. 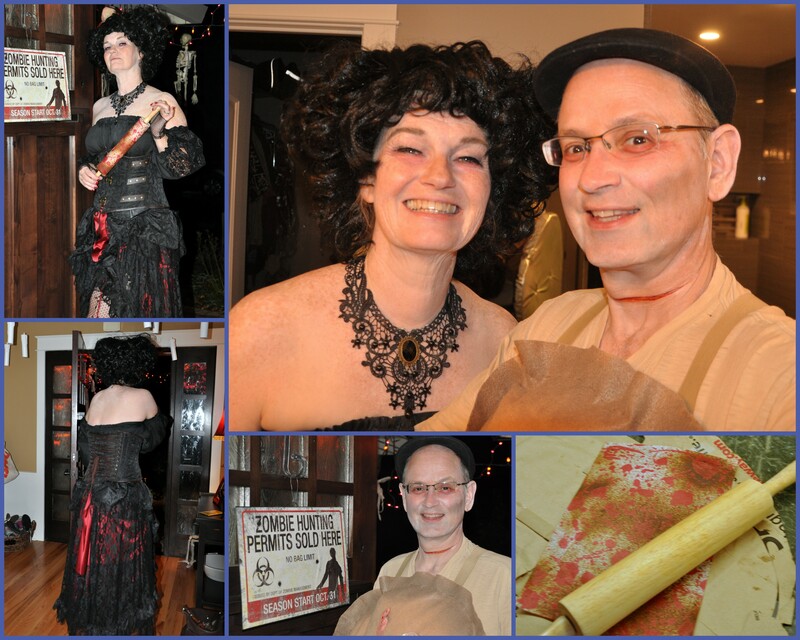 Brilliant party, a great theme and wonderful costumes. I like your front garden. I’m still clinging to the lawn and borders in my front garden, but there is so much moss in the lawn that I think it is only a matter of time before I do something drastic and dig it all out!! Thank you for stopping by, Polly and for your kind words. 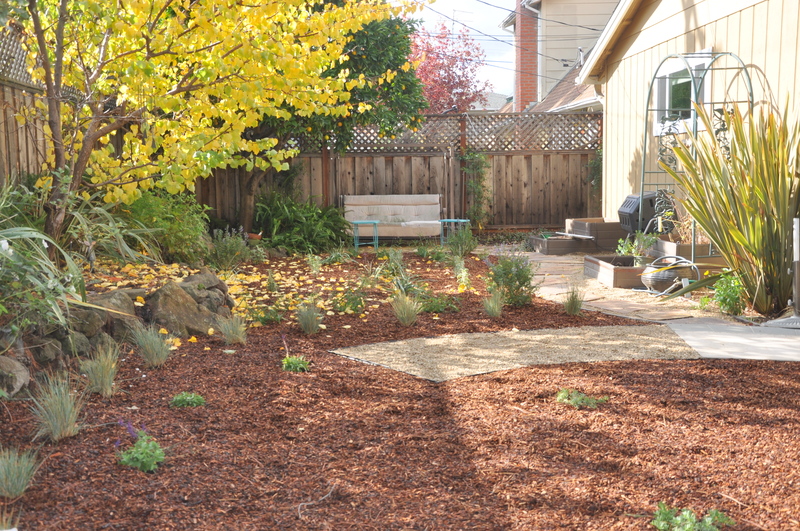 It’s a big change moving away from lawn, mostly because I think it has been the “norm” for many of us for so long. 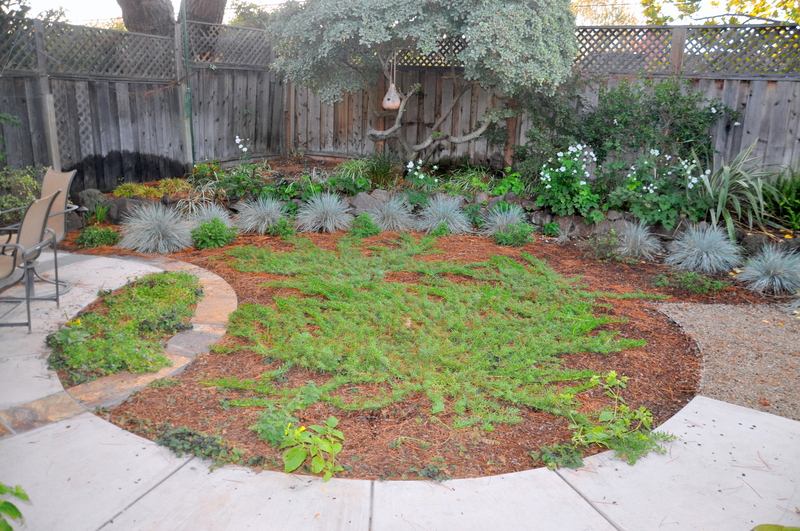 Once I opened up to the possibilities, and convinced my husband that it was ok to let the lawn go, the process was a steady one. Good luck with your decision. 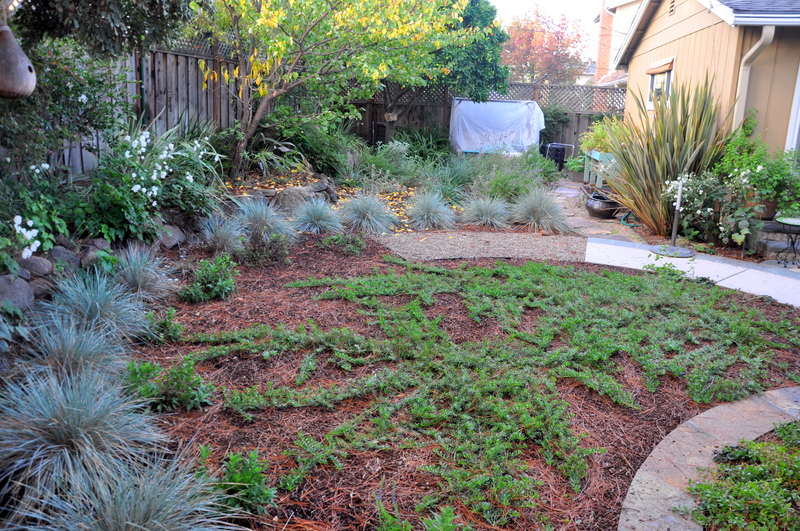 I love how you’ve turned your garden into a sustainable one! It’ll be amazing to see it take shape over the years. I’ve always wanted to do something like this in our front yard too, but it’s a bit more challenging in our Canadian climate. Maybe next year! 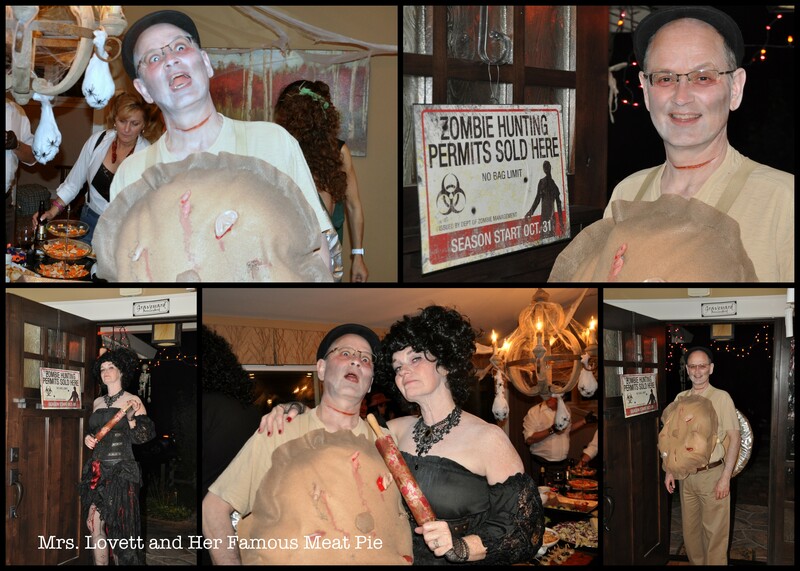 You look like you had a blast at the Halloween parties; wonderful costumes (and you look great as a brunette)! I know the Canadian climate presents its own challenges. We’re lucky to have mild weather year round. But if anyone can figure out a change, it’s you. Oh goodness, you were frightening. I caught on to the Sweeney Todd bit right away!!! Your lawn looks fabulous, and I assume will continue to grow into itself and change. It’s really quite lovely. Rest up, girl! Thank you, Lisa! It’s been fun seeing it fill in over the year, and of course last spring the area filled with purple flowers, a nice bridge into the summer. Thank you, Cathy. I love putting together costumes, dressing up, and in general the wonderfully festive feel of this time of year. I’ve heard once that it takes about 18 months for perennials to establish themselves, so if true, they are well on there way. It seems too early for the sweet peas to be up, but I’m hoping they make it past any cold days and fill the garden with wonder once again next spring. Alys, what a great post! Your maturing garden looks wonderful. Isn’t it incredible what a year will do? I’d love to plant some of that salvia. 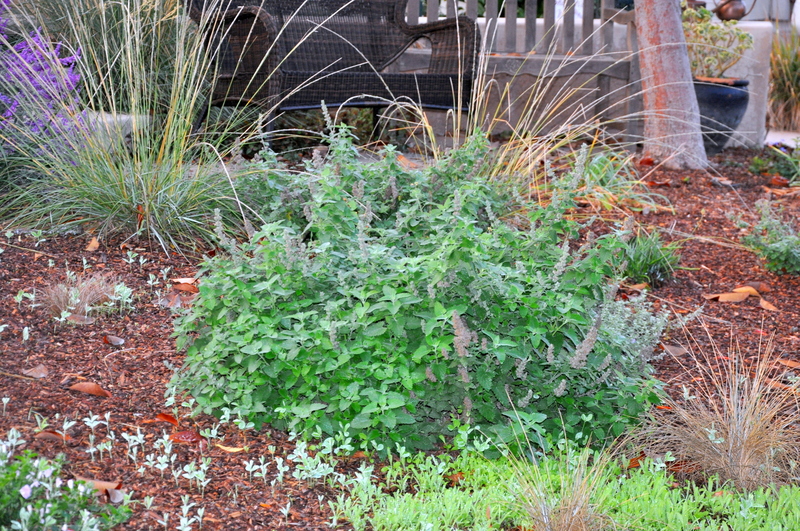 The purple blooms on the almost sage green leaves are such a great contrast. In terms of Halloween: you always have the most stunning costumes and Mike carves the best pumpkins. Thank you, Laurie! That salvia is really gorgeous, isn’t it? The hummingbirds love it as well. Thanks, too, for your kind words on Halloween. We really enjoy ourselves. The Sweeney Todd party must have been such fun. I don’t know what kind of pies you have in the States but I can imagine what we would have had here (pork pies). I hope your British hosts aren’t about to be kicked out of the country, if the unthinkable happens tomorrow. Anyway, on a lighter note, setting up a garden takes patience, doesn’t it? At first, the ground is so bare! Interesting to learn it takes about eighteen months for a perennial to feel at home. No wonder various things I’ve moved around still look a bit the worse for wear. I’m a vegetarian, so my favorite pies are sweet (pecan, apple, pumpkin or strawberry) but a popular American dish as chicken pot pie, a mixture of vegetables and chicken in a thick broth. Our British hosts are wonderful people. I can’t even imagine a scenario where they were asked to leave, but it certainly is a fear of many, especially anyone that doesn’t conform to some warped idea of what it is to be an American. My family immigrated from Canada and my father was British, immigrating from England to Canada and then the US. My husband’s parents immigrated from Argentina, his dad via Italy. We’re our own melting pot. One of the great things about living in Silicon Valley and the Bay Area in general, is that we are a huge melting pot. The diversity is a blessing, not a curse. I don’t know why it threatens so many people. 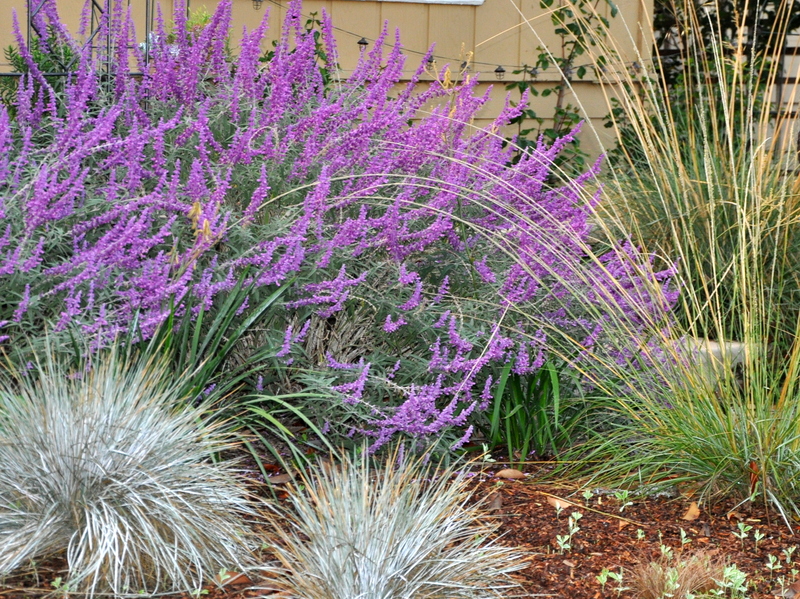 As for the perennials, I’ve found that moving shrubs or trees does set them back a bit. They need to re-establish roots and then, if their conditions for water, light and air are met, they do well. I agree that have people from different backgrounds is a blessing not a curse, so I truly hope it will be good news tomorrow! Helen, I’ve seen some of those articles as well. Isn’t that something? It makes me tingle with pride. My mom was born in 1919 in Nova Scotia, Canada. Women were given the vote there one year earlier. It feels like a lifetime ago and it many ways it was. Our polls are open for another four hours. Then the results will come rolling in. I seem to remember when Obama was elected in 2008 that we got the news here about 6 in the morning but it’s 7:30 now and the New York Times is still talking about predictions. I think you’ll know more than me so I don’t think I need to elaborate. So sorry, Alys. 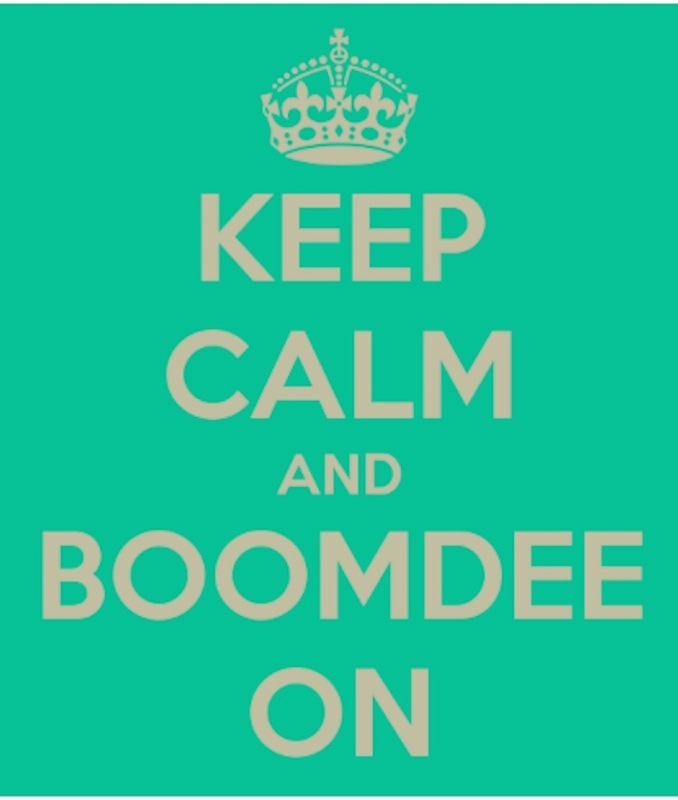 Heard on the drive into work! 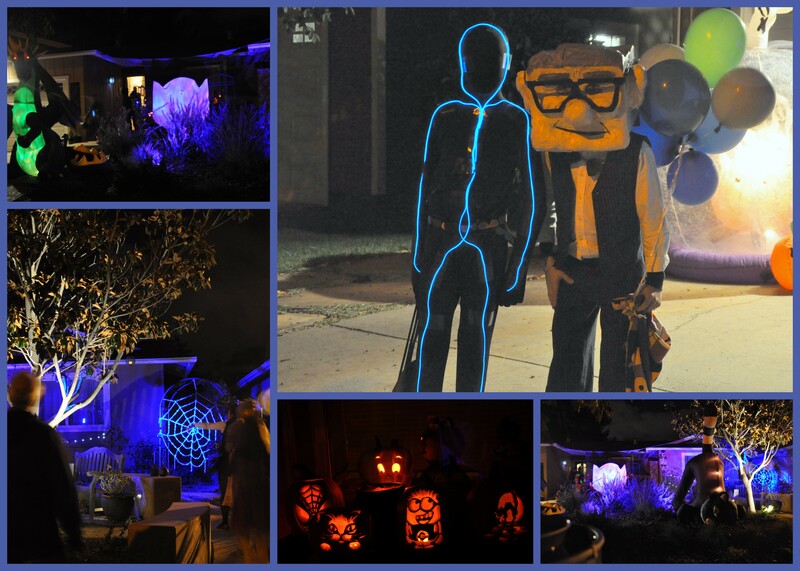 Love the costumes – looks like both parties were a lot of fun! Thank you! We had a terrific time. I’m holding me breath for tomorrow as I’m sure you are too. I can’t wait for it all to be over. I adore the ribbon around your neck. It’s stunning..I’m happy you have had such a decent month.. Taking out the lawn is so sensible, and I love seeing what you are doing. 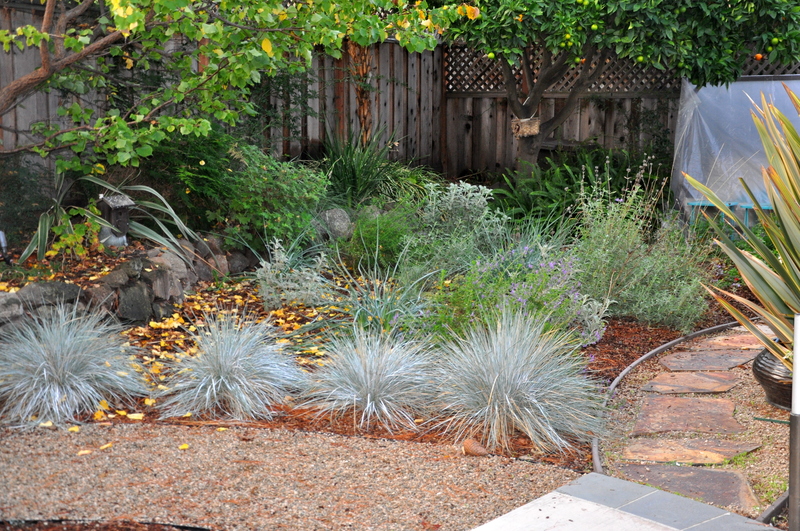 Even when the rain comes back (and it will rain…..someday) I think you will have fallen in love with your new garden. So much more biodiversity and interest. Enjoy! Thank you, Anne. I can’t imagine ever turning back to lawn. The visiting hummingbirds alone make it all worthwhile. It’s far more interesting than grass. Your garden is looking incredible! Simply sit tight for the following year. I wager you’ll experience considerable difficulties the ground!.. Thank you! Yes, I think you’re right. And of course now that we’ve had a touch of rain, all the volunteer sweet peas and Nigella are up leaving a lovely green blanket. I clicked over to your site, by the way. Those look like trips of a lifetime, especially the ones with the big cats. Fabulous creatures.